A little while back I wrote about an aerobic oxidation which was greatly improved by switching from a traditional round bottom flask setup to a continuous flow reactor – basically, continuous flow reactors are much better at handling oxygen, especially on scale. But most of the advantages of the flow reactor were specific to that reaction, and it wasn’t clear to me how a flow process would improve a reaction that doesn’t use oxygen, or some other gas. Fortunately, a lot has been published since then to help me get a handle on how continuous flow reactions can contribute towards greener processes. In particular, this review covers continuous processing within a green chemistry context, and Organic Process Research and Developement has a continuous flow themed issue in their ASAP section, including this process-oriented review (speaking of OPRD, check out this recent editorial concerning solvent selection and green chemistry). It turns out that flow chemistry can improve processes in a bunch of different ways, and it’s hard to get a sense for how this can work by just looking at one reaction. So I’ll cover a few different reactions that illustrate different green aspects of continuous flow reactors. One benefit of flow reactors is improved control over reaction temperature, due to reduced reaction volume at a given time, higher surface area, and the movement of the reaction mixture. This is particularly helpful for very exothermic reactions, which often require cryogenic cooling to prevent runaway reactions – this type of cooling is very expensive and resource-intensive on a large scale. One such reaction is described in a recent paper from AstraZeneca, in which a phosphinate anion adds into a glycine derivative. The product of this reaction is an intermediate in the synthesis of a gastroesophageal reflux inhibitor drug candidate called AZD6906. “Production of amorphadiene in yeast, and its conversion to dihydroartemisinic acid, precursor to the antimalarial agent artemisinin” Westfall, P.J. ; Pitera, D.J. ; Lenihan, J.R.; Eng, D.; Woolard, F.X. ; Regentin, R.; Horning, T.; Tsuruta, H.; Melis, D.J. ; Owens, A.; Fickes, S.; Diola, D.; Benjamin, K.R. ; Keasling, J.D. ; Leavell, M.D. ; McPhee, D.J. ; Renninger, N.S. ; Newman, J.D. ; Paddon, C.J. Proc. Natl. Acad. Sci. U.S.A. 2012, 109, E111-E118. DOI: 10.1073/pnas.1110740109. Malaria, caused mainly by the parasite Plasmodium falciparum, leads to nearly a million deaths and 250 million new infections each year. The sesquiterpene lactone endoperoxide artemisinin, derived from Artemisia annua, is very effective as an antimalarial drug, and widespread resistance hasn’t yet developed. 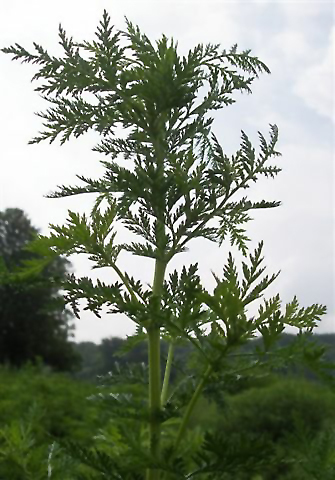 Artemisinin is the only high-volume drug that is still isolated by extraction from its native plant producer in a low-yielding (around 10 μg per g plant material), resource-intensive process that uses volatile solvents (most commonly hexane). Artemisia annua. Photo credit: Jorge Ferreira via Wikimedia Commons.